Claas, an agricultural machinery manufacturer, and its IT sector, Agrocom, have entered the animal identification sector to offer flock masters help with the European Union’s individual sheep electronic identification regulations, reports Farmers Weekly. The new European regulations say any sheep born or identified after December 31, 2009 must be electronically identified. Under the brand name Mutterschaf, Claas with introduce RFID chip-earmarks, lightweight wireless hand-reader and flock management software. There is enough space in the system to store up to 3,000 details per sheep – capacity for recording details such as ID number, lambing record, tupping batch and all veterinary treatment records. 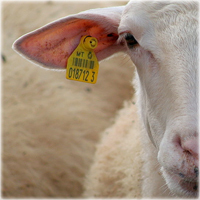 The chip information can be read by portable readers, such as the APR 350/380, from several yards away, and should cost about £1.75 ($2.78) a sheep.